SOUTH HADLEY – Gaping ruts mar an open field growing tall, caramel-colored grass. Tires have tamped it down, leaving flattened patches. Trenches of mud, nearly a foot deep, tarnish the terrain. Water pools into these unnatural formations. It’s not just any field. It’s conservation land – the Bynan Conservation Area – home to wetlands and at least two species of varying endangered classifications. And it’s being destroyed by ATVs and vehicles off-roading. Signs, said Stone, are ignored or moved. Bynan Conservation Area consists of 162 acres of land purchased by the town in 1978 from Patrick Bynan’s heirs. The area abuts the South Hadley landfill and houses large power lines. The ecology is similar to Cape Cod, with pitch pine and oak woodlands, paired with wetlands and ponds. With numerous access roads – most notably via the power lines, New Ludlow Road, Bartlett Street and Lyman Terrace – Bynan Conservation Area is available for the public to use its walking trails. The land is home to the Pine Barrens Zanclognatha, a moth listed as threatened in Massachusetts. It is rare and its distribution is “spotty” throughout the state. Pines Barrens moths inhabit pitch pine and scrub oak barrens. Larvae feed on the pitch pine. “The South Hadley Pine Barrens is only one of three known populations in Western Massachusetts, and one of five in Massachusetts,” said Stone. This local population lives in the Bynan Conservation Area and parts of Westover Air Force Base. When landfill expansion was discussed a few years ago, “This was a big part of the permits,” said Stone. The landfill was set to expand into the Pine Barrens’ habitat. The expansion was not completed. Discovered recently during permitting for a methane gas pipeline between the South Hadley and Granby landfills, the Bynan Conservation Area is home to the Blue-Spotted Salamander, which makes its habitat in sandy, swampy areas and vernal pools. According to Massachusetts Division of Fisheries and Wildlife, the Blue-Spotted Salamander is a legally protected species and is listed as “special concern” in regard to endangered species. Bynan’s numerous shallow ponds and vernal pools are habitats for a number of other amphibians. These are being destroyed by individuals who take motorized vehicles out onto the conservation area’s trails. “There are quite a few shallow ponds, some of them more into a deep marsh, and these vehicles will drive right across them,” said Stone. “Sometimes they get stuck. They’re really destroying the habitat, and they’re creating new ruts and channels. It’s changing the hydrology of these ponds and vegetation.” This causes erosion and sedimentation problems. Stone said these motorists are creating new trails on which they take ATVs, jeeps or trucks. The Conservation Commissions has blazed official trails, but ones created by motorists “are endless shortcuts. … It creates this squiggle of trails everywhere, which makes it more difficult for us to keep control over. It would be one thing if they just stayed on the trails, but they don’t,” she said. Not only is the Bynan Conservation Area home to endangered amphibians and moths, but to plants, as well. Off New Ludlow Road lies a rare plant, which Stone declined to name. It’s unclear to Stone when this illegal activity is taking place. Immediately after the first snowfall in December, someone had already driven through the conservation land, leaving obvious tracks in the snow. A paintball area has been discovered within those woods, and often dumped garbage is found, like tires. The act of bringing in artificial material is what bothers Stone, as well as the efforts made to change the landscape. Ironically, Stone said it seems residents don’t use the area enough by simply walking or hiking. “It would be nice to be able to change that,” she said. Recently, the South Hadley Bike/Walk Committee blazed a trail in the Bynan Conservation Area marked yellow. Rogers once happened upon a motorist driving a truck in a Bynan vernal pool. “My wife and I went out to document one of the vernal pools at night one time and stuck in the middle was a pickup truck,” he said, recalling the driver asked Rogers what he and his wife were doing in the area. Now that the South Hadley Police Department has SUV police vehicles, Police Chief David LaBrie said the department will be able to more easily access and patrol the entrances to Bynan Conservation Area. “I would encourage people to call us,” he said, especially residents who live near the property. Noise in that area during the night is most likely from those ignoring the posted signs. “We do get calls,” said LaBrie. Rogers suggested putting up a gate at the Lyman Terrace entrance near the power lines. The recent addition of gravel to the area around the power lines is making “it inviting and easier for trucks and cars to access Bynan,” said Rogers. More gates at all major access points and more warning signs are needed, he said. Educational seminars about the Bynan Conservation Area is another suggestion from Rogers. Because the Conservation Commission is made of volunteers and those working part-time, resources are limited, said Stone. She too suggested more public eduction as a means to stop the destruction of habits in the Bynan. The best bet, she said, is to get an idea when motorists are using the area through calls from residents. While Stone said it’s hard to prosecute offenders because “it takes a lot of police time,” LaBrie encourages residents to keep reporting. The area borders Granby, so Granby residents are also encouraged to contact the South Hadley Police Department if they see or hear any illegal activity. LaBrie recalls charging someone within the past few years for driving a truck in the Bynan Conservation Area and getting it stuck. Penalties include charges of trespassing with an internal combustion engine, destruction of property and trespassing. The South Hadley Police Department can be reached at 538-8231. Press 6 to leave an anonymous tip. The Conservation Commission can be reached at 538-5017 txt 208. Stone can be emailed at jstone@southhadleyma.gov. SOUTH HADLEY – Construction has begun in the first step of creating a brand new Plains Elementary School Building. 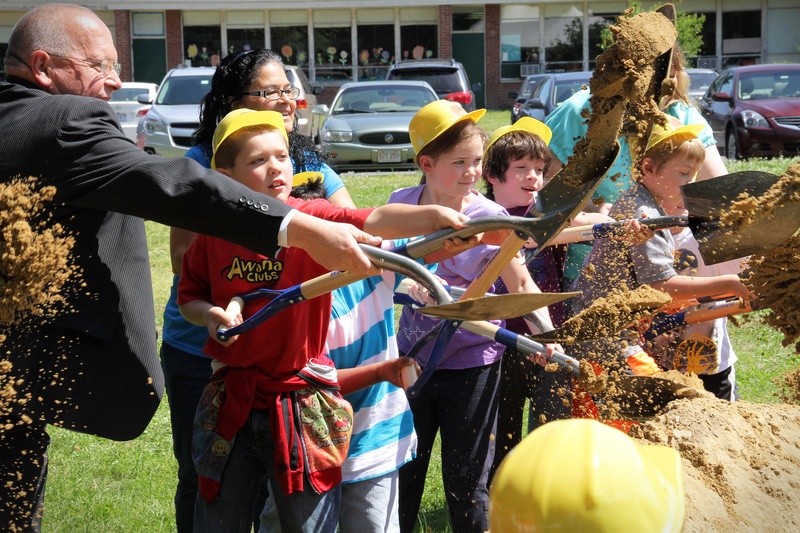 On Friday, May 30, officials held a ground-breaking ceremony. Following remarks from state and school officials, students from the school donned toy hard hats and sang a song to the administration and spectators. More than 80 years old, the Plains Elementary School is outdated and inadequate. Classrooms are undersized. Portable classrooms have been used beyond their lifespans. The parking lot poses a problem as does antiquated fire protection systems. The new two-story school features a single, secure point of entry; a covered and natural play area; energy efficiency with a silver LEED certification; a 6,000 square-foot gym, a library/media center and 21 classrooms including those for art, music and special education. “We could not do this on our own,” said Selectboard Chair John Hine. He credited the Commonwealth and the residents of South Hadley for their efforts. “Many people voted, many people who don’t have children,” he said. Overall, South Hadley voted 2-1 for creating a new building. “It’s really an act of faith when a community comes together and says, ‘I believe in our future,’” said State Senator Stan Rosenberg. Building a new school signifies the community is building a future for one another, he said. Two phases will first find workers creating and finishing the new 63,000 square-foot building by July of 2015. The second phase includes the demolition of the current structure and a parking lot creation. Completion of phase 2 is set for Sept. 30, 2015. State Representative John Scibak gave credit to the teachers who have worked in the Plains School building and dealt with the conditions. “It’s an awful facility,” he said of its current state. Fontaine Brothers have been awarded the project bid. School will remain in session as the new school building is constructed. Security fences and jersey barriers will be put in place around the school to ensure student safety from the work zone. The total project budget is $25.9 million. The Massachusetts School Building Authority will cover half of the budgeted cost. SOUTH HADLEY – An overwhelming majority voted in favor of a debt exclusion for a new Plains School while an effort to change two town positions from elected to appointed just squeaked by. A 19.4 percent voter turnout was recorded of the town’s 10,729 total active voters. Question 1 asked residents to allow a temporary hike in taxes in order to construct a new Plains Elementary School on the current property. A total of 1,364 residents voted in favor, while 720 voted against this question. The project will cost $28,183,801 million. South Hadley is responsible for $12.9 to $14.3 million, with the Massachusetts School Building Authority covering between $13.9 and $15.3 million. The project would cost the average taxpayer $131 per year over the course of 20 years. Question 2, which sought to adopt legislation recommended by the Financial Policy Advisory Team [FinPAT] which would first separate the position of Town Clerk-Treasurer into two different positions, and second, change these positions and the position of Collector from elected by residents to appointed by the Town Administrator, with Selectboard approval. This question passed by 87 votes. A total of 1,054 residents voted in favor of the change, while 967 voted against. Breaking votes down by precinct, 228 residents in Precinct A voted in favor of Question 1 while 106 voted against. For Question 2, 163 residents voted in favor, 159 against and 12 left the question blank. In Precinct B, 308 residents voted in favor of Question 1, 173 against and one left it blank. For Question 2, 245 residents voted in favor, 222 voted against and 15 left it blank. In Precinct C, a total of 322 residents voted in favor and 176 against. For Question 2, a total of 242 residents voted in favor, 241 against and 15 left it blank. In Precinct D, a total of 208 residents voted in favor, 101 against and one left it blank. For Question 2, a total of 170 residents voted in favor, 130 voted against and 10 left it blank. Finally, in Precinct E, 298 residents voted in favor of Question 1 and 164 voted against. For Question 2, a total of 234 residents voted in favor, 215 against and 13 left it blank. SOUTH HADLEY – Plains Elementary School is just plain ‘ol not up to code. With no fire sprinkler system, undersized classrooms, parking predicaments and inefficient windows, the school – and school administration – is ready for a complete overhaul. Architects for the Plains Elementary School building project presented the future plans for the new school in a public meeting Monday. Project estimates calculated at the end of the schematic design phase, with input from the Massachusetts School Building Authority [MSBA], reveal the project will cost $28,183,801 which includes furniture, contingencies and escalation. Reimbursement from the MSBA will potentially amount to anywhere between $13.9 and $15.3 million, leaving the town to pay between $12.9 and $14.3 million. Should school officials pursue just the correction of building deficiencies and forgo new construction, the project would cost $12.3, not including the cost of portable classrooms to house students during renovations. She and her team were able to speak with designers about what works well at Plains School, what their goals are for the future and what definitely does not work well. With that input, she said, the building plans are truly tailored specifically to student needs. For instance, classrooms are designed in neighborhoods. Five classrooms surround an open meeting space visible and accessible from each room. In the neighborhoods are two smaller rooms for small group discussion and individual instruction. This floor plan, Flanders said, “creates a sense of independence” for the students. “It’s so exciting to me!” she said. Another component, which directly benefits the community, is the public accessibility to the grouping of the stage, gym, cafeteria and library. This section of the school can be secured separately from the classroom portion of the Plains School building. Additionally, the school will be able to serve the town in the event of an emergency, with the future installation of a large capacity generator and full kitchen. “There aren’t a lot of facilities in town that have that capacity,” said Nicholas Macy, senior project manger of Arcadis, the firm working on the project in conjunction with Margo Jones Architects. Should Town Meeting Members approve of a debt exclusion for the project Thursday, Jan. 10 (the meeting occurred after press time) architects can start the 10 to 11-month design phase. 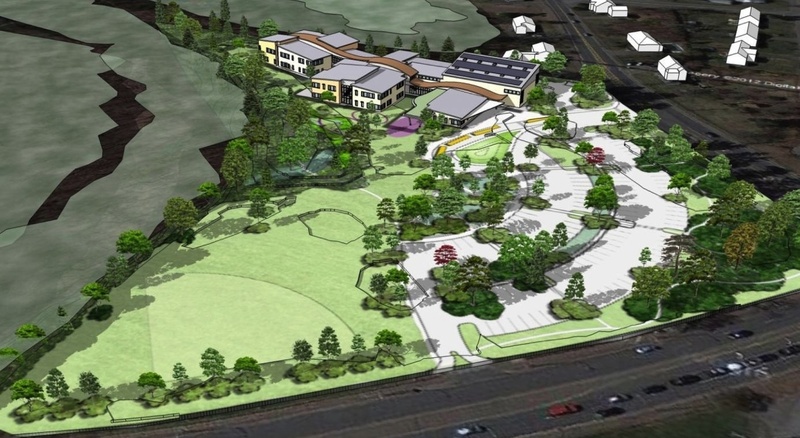 Construction would occur throughout 2014 and 2015, with the school opening in the fall of 2015. Residents interested in seeing the plans for the new building up close should attend the next public informational meeting to be held Feb. 6 at 6:15 p.m. at Plains Elementary School. A tour of the current building will take place. Additionally, residents can email schoolbuilding@shschools.com or visit http://www.newplainsschool.com for more information. SOUTH HADLEY – Having agreed upon a location for the new Plains Elementary School Building, officials must now determine whether one story or two will better serve the needs of students. In the design plans for both types, the new school building has shifted to the right when viewing the edifice from Lyman Street. Similar in the majority of characteristics, neither site would require phasing or incur additional traffic costs. Invasion of wetlands is not a problem for either proposal and endangered species would not be disturbed. Potential future plans for Mosier Elementary School would not be limited with these existing locations, as would the remaining options for the new school location. Another pro for both sites is the playing field adjacent to the new school. Unfortunately, no other primary schools are located in close proximity- the only con to either proposal. Roughly, the cost for a one or two-story school would fall between the $22 and $26 million range. Construction of a two-story building would cost less than a one-story. 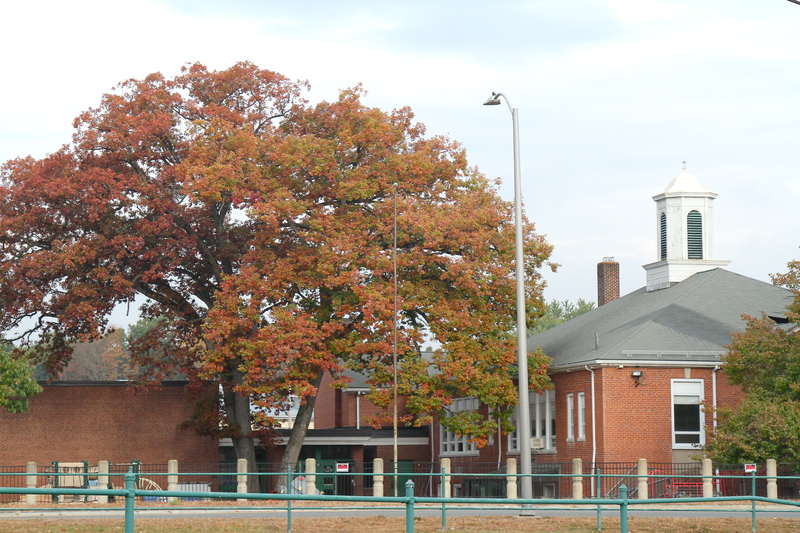 “The two-story option has some advantages,” said John Hine, a member of the South Hadley School Building Committee and Selectboard Chair at the April 24 meeting of the Selectboard. He added the two-story building appeared to be the preference of the School Building Committee. This option would maintain a smaller footprint and would offer more open space than a one-story building. The plan for a new Plains Elementary School has been in the works since 2004 when an Elementary School Facilities Study Committee recommended the formation of a Building Needs Committee in order to work with an architect to evaluate the building’s needs. In September of 2006, five options were presented to the town, ranging from taking no action to construction. In June of 2007, members were selected to the South Hadley Building Committee, which was charged with maintaining renovation/construction plans within Massachusetts School Building Authority time and guidelines. 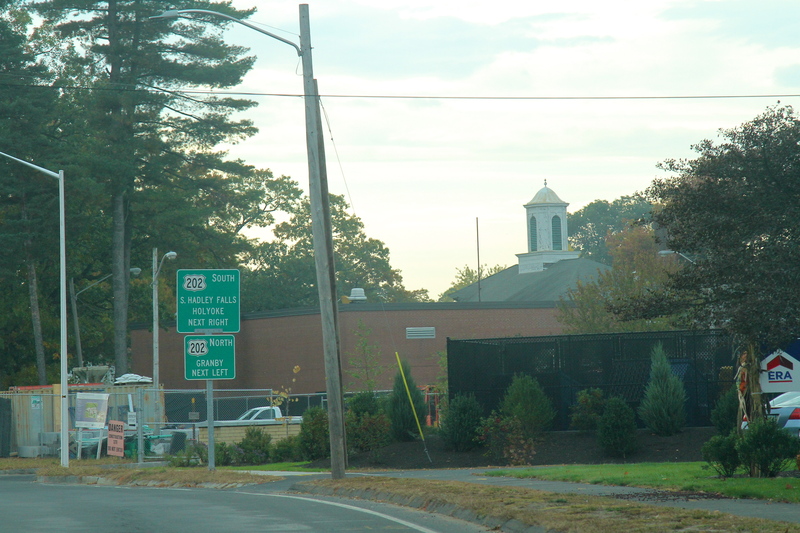 Finally, on Nov. 9, 2010, Town Meeting Members voted to appropriate $750,000 for a feasibility study/schematic design to be carried out to determine if renovation of the current building or construction of a new one was needed. It has now been determined a new building is in fact necessary. Currently, the 80-year-old Plains Elementary School building is in need of serious infrastructure updates. Classrooms are undersized and overcrowded. Portable classrooms set up more than 20-years ago to aid in housing an abundance of students are still used today –much beyond their lifespan. Special Education classrooms are considered inadequate, as are exterior program facilities. The ventilation system is not up to par and the fire-alarm system and protection is deemed antiquated. The library and computer rooms are too small and accessibility to particular rooms and the building itself proves to be problematic. Finally, the parking predicament and drop-off/pick-up areas are not adequate. Design schematics for an updated building of one or two stories show four clusters of classrooms – three consisting of kindergarten and first-grade students with the fourth cluster consisting of just pre-k students. In the middle of the clusters is a media center with art and music rooms. The gym area and cafeteria are grouped together away from the classroom clusters, opposite the point of entry to the school. At this point in the project, a land issue must be figured out. A 17-acre parcel of land on which officials would like to build a new school abuts the current Plains Elementary School building and runs behind a home on Lyman Street. Previously, it was thought the Conservation Commission owned this land. But, as Hine pointed during the April 24 Selectboard meeting, research was conducted which revealed ownership of the land was transferred to the town of South Hadley in the 1900s. The deed does not show any conservation restrictions in regard to land use, said Hine. At some point, the Conservation Commission began to consider the land as part of conservation land. The acreage is home to the Black Stevens Conservation area and a handful of walking trails. An idea was tossed out during the meeting to use four to four-and-a-half acres of the parcel for the new Plains Elementary School building and officially transfer the remaining approximate 13 acres to the Conservation Commission. Regardless, the ownership problem will need to be sorted out in the near future, as schematic designs of either a one or two-story building will be developed between May and July, with the final designs needing to be submitted to the Massachusetts School Building Authority by Aug. 9. SOUTH HADLEY – If the end of summer doesn’t trigger back-to-school vibes, shopping for supplies certainly does. Nothing says school is starting quite like fresh reams of paper, crisp notebooks, a plethora of pens and packs of pencils. Unless of course, one is not fortunate enough to participate in such a ritual. But for those in need, there’s Margie Bacon and her Operation Backpack team. As is the case for many younger clients at the Neighbors Helping Neighbors Food Pantry and those in need, dozens of items detailed on school supply lists go un-purchased due to lack of funds. There is no thrill of shopping for new outfits to wear in school photos and well-worn backpacks consistently graduate with their wearers to the next grade. But with the help of Operation Backpack, less fortunate students in South Hadley have been – and will continue to be – supported with school supplies through a collection drive. Bacon has witnessed first-hand the need for backpacks and school supplies as she volunteers at the food pantry. This year, she has a list of 200 South Hadley students whose families aren’t able to afford the necessities. Five years ago, Bacon decided to do something about this issue, and founded Operation Backpack. Last year, the team donated 325 backpacks to students whose families asked for help. With Sheila Adams and Norm Picard, Bacon collects school supplies and backpacks. This operation is year-round – as is the need. South Hadley residents and businesses are asked to help. Residents can donate in three ways. First, they could purchase a backpack. Second, they could purchase supplies from a wish list. Thirdly, they could donate via check or a Walmart or Target gift card, which would be used by Bacon or Adams to purchase school supplies that might not have been donated as much as others. Drop off locations are Saint Patrick’s Church, Newton Street Dental, Berkshire Bank on Lamb Street and the Neighbors Helping Neighbors Food Pantry. Checks may be made out to Operation Backpack and mailed to Sheila Adams, 36 Chestnut Hill Road, South Hadley. 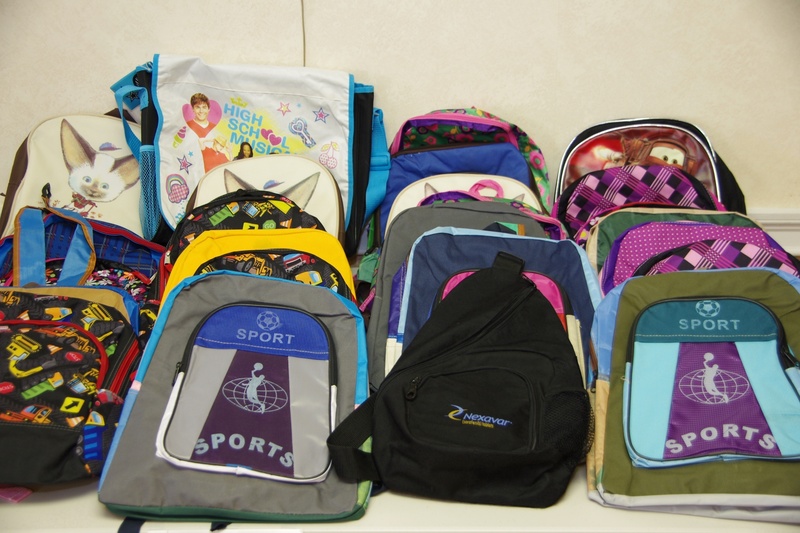 Operation Backpack assists year-round. So if a backpack given to a student in the beginning of the year breaks, the student’s parents can call Operation Backpack and receive a new one. If the student uses all of their pencils, markers or pens, Operation Backpack will restock his or her supply. The organization will deliver to a student’s house or discretely to his or her school. “Some of the parents come in and cry,” said Bacon. To contact Bacon to set up a donation or to inquire about receiving a backpack or supplies, call 413-887-9203. 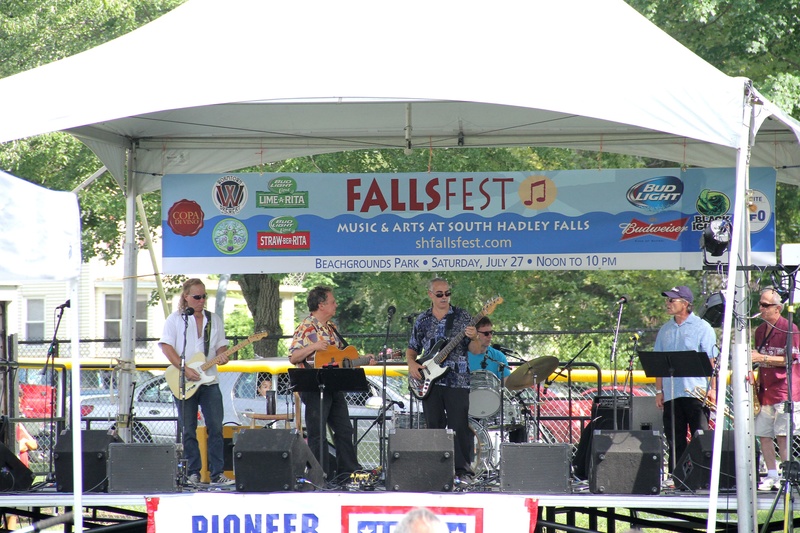 SOUTH HADLEY – An 11-hour-long musical medley will fill Beachgrounds Park next weekend with the return of FallsFest. The annual festival of music, food and fun starts Saturday, July 25 at 11 a.m.
“We’re really super excited about it,” said FallsFest Co-Chair Ira Brezinsky. Music geared toward children begins at 11 a.m. with Jose Gonzalez and Banda Criolla Caribbean Fiesta for Kids. “We’re trying to encourage families with young kids to come to that,” said Brezinsky. About every hour after that features a different musician or group on two stages. While the music plays on, visitors can dance in a dance party tent, grab delicious local fare from nine food trucks, lounge at the beer and wine garden and visit local artisans and vendors. For children, an activities tent provides a musical instrument petting zoo, arts and crafts, Zumba, a visit by Elsa and Anna, as well as other fun activities. Thirty community organizations will have booths set up promoting non-profit groups. About 29 juried artists and vendors will sell their photos, paintings, drawings, wares and creations. “It’s really very high-quality stuff,” said Brezinsky. The evening really gets going with live music at 5 p.m. starting with The Mary Jane Jones band, followed by NRBQ at 6 p.m., Seth Glier at 7:30 p.m. and Marcia Ball at 8:30 p.m.
“We want the entire town to be there,” said Brezinsky. To make it easy for everyone to attend, FallsFest partnered with the Council on Aging to provide a shuttle from various designated parking areas throughout the Falls area. Surely, the annual event will draw a large crowd. Each year it grows in popularity and size. Brezinsky said the event draws visitors from as far as Boston and Connecticut. After that party, Brezinsky and Constant brainstormed a festival that featured live music. Piggybacking off the South Hadley Falls Neighborhood Association’s idea of gathering in the Falls for a fun event, Brezinsky and Constant came up with FallsFest. “The word is getting out,” said Brezinsky. He’s expecting about 40,000 visitors to FallsFest this year. Entry into FallsFest is free. To find the complete schedule of events and musical lineup, visit http://shfallsfest.com. SOUTH HADLEY –The South Hadley Falls Neighborhood Association [SHFNA] is putting its best face forward to combat pedestrian problems on Main Street. Members are launching a safety “selfie” campaign during FallsFest called “#ICrossHere” to raise awareness about crosswalk safety, especially near the Beachgrounds. “Almost all of Main Street has reduced visibility,” said SHFNA Chair Gillian M. Woldorf. Most concerning for her are the crosswalks near the Beachgrounds, where Main Street meets Spring, Pleasant and Lamb. Additionally, the crosswalk at Carew Street and limited visibility further north on Lamb Street between Route 202 and Bridge Street are problematic. “I think that the entire stretch of road is quite dangerous for pedestrians, and we are lucky that we haven’t seen any pedestrian accidents,” said Woldorf. The police department recently applied for and received a $2,705.04 grant to enforce crosswalk and pedestrian laws by the Executive Office of Public Safety and Security (EOPSS) Highway Safety Division. This week, the department had a patrol out on Main Street specifically tasked with monitoring crosswalk safety. The Beachgrounds draws a wide range of ages to the park. On the opposite end of Main Street, the South Hadley Public Library draws the same. Closer to the library, Woldorf is concerned about the proposed development at 1 Canal Street, “as the combinations of the hill, the height and angle of the Tech Fab building, and the curve in the road already reduces visibility,” she said. Previously, Woldorf commuted to Northampton by bus, and would often walk home from the Holyoke bus terminal in the afternoon if she missed a connection. Twice now, Woldorf has been nearly struck while crossing on Lamb Street by motorists who did not observe her while they made a turn. “I was never sure whether motorists coming south on Main were going to turn left to go up Lamb, and if they would see me as they came around the curve,” she said. Pedestrian safety is a personal issue for Woldorf. When she and her cousin were 12, her cousin were struck by a motorist and seriously injured. “This was in the early 90s, before we had cell phones and other distractions,” she said. Her cousin was in a crosswalk, and crossing with the light. Signs alerting motorists to pedestrians in crosswalks are installed near the Beachgrounds crosswalks. “But inexplicably, these signs are about two feet tall,” said Woldorf. “So if you’re driving along Main Street and you don’t see a pedestrian waiting in the crosswalk, you are probably not going to notice a two-foot-tall sign on the curb, even if the post is painted yellow. And you are definitely not going to notice the signs on the curb at the intersection of Pleasant Street if there are cars parked along Main Street,” she said. Ultimately, motorists need to yield to pedestrians using a crosswalk. Town Administrator Michael J. Sullivan said the town is aware of the sight-line issue and crosswalk concerns. This issue, he said, needs to become a part of the “walkable streets” conversation. “We try when we have the ability,” he said, of making changes to improve traffic issues. For instance, the town recently added three seconds to the crossing light at Hillside and Granby Road. It “doesn’t seem like a lot, but the person who was concerned about it has said it’s made a tremendous difference,” said Sullivan. Woldorf suggested the town hire an engineering firm to map out sight lines at these intersections with Main Street. She cited an idea from a Redevelopment Authority advisory board meeting to turn the intersections of Main and Bridge streets and Main and Lamb streets into small rotaries. Less costly suggestions include installing along Main Street speed bumps, flashing signs, flashing bollards, embedding lights into the road, or raising the height of signs already installed. “An ounce of prevention is worth a pound of cure,” said Woldorf. All are encouraged to participate in Saturday’s selfie campaign. Woldorf said SHFNA will have signs with which participants can pose in their photos. Those who wish to participate, but without posting selfies, can wear bright yellow awareness stickers distributed by SHFNA. Send your “ICrossHere” selfies to The Town Reminder to potentially appear in next week’s edition of the paper. 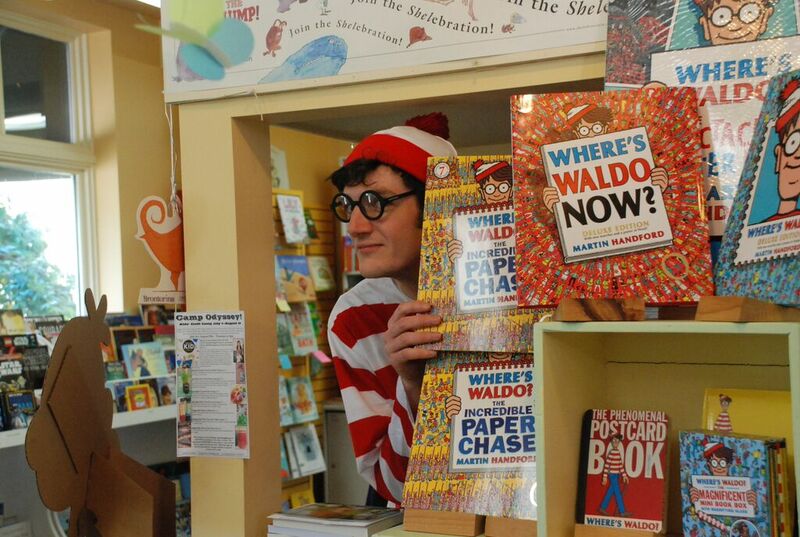 REGION – The Pioneer Valley will become a region-wide hunt for Waldo of “Where’s Waldo?” fame throughout July. A miniature cutout of the iconic character was placed in 25 different local businesses from Holyoke to South Hadley to Northampton as part of the Odyssey Bookshop’s effort to promote reading and shopping locally. Look for Waldo in South Hadley at the South Hadley Public Library, the Odyssey Bookshop, the Thirsty Mind, Tailgate Picnic, Crazy Moon and McCray’s Farm. 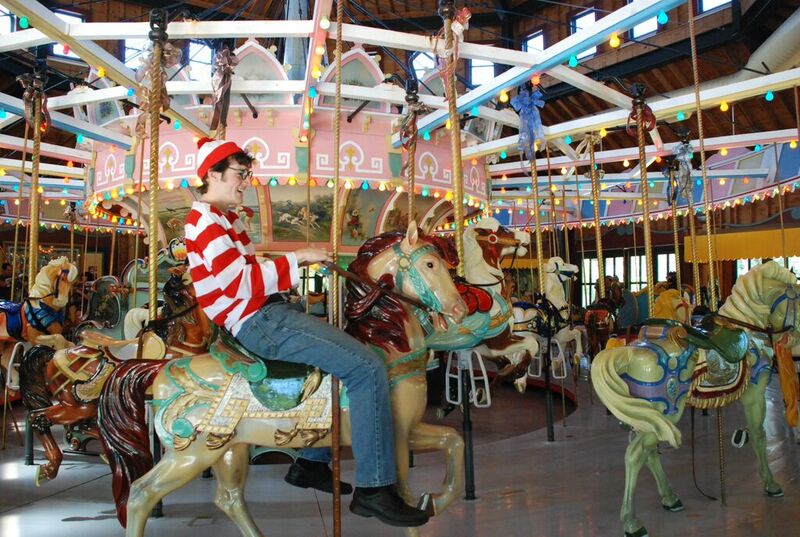 In Holyoke, he’s hidden at the Holyoke Merry-Go-Round and the Children’s Museum. To get in on the search, stop by the Odyssey Bookshop to grab a “Find Waldo Local in The Pioneer Valley” passport with the names of all the participating locations. Once Waldo has been located inside a business, a stamp will be placed in the passport by a business employee. The first 100 participants to collect 10 or more stamps in their passport can show the collection at the Odyssey for prizes. More than 20 collected stamps will entitle participants entry into a grand prize drawing. “I think it’s a fun activity for kids to do,” said Moushabeck. Some children even dress as Waldo while searching for the colorful character. It’s the fourth year the Odyssey has hosted the Waldo search and there’s no plans to stop. Moushabeck said it’s a good fit for the Pioneer Valley. This “Where’s Waldo?” search allows residents in the area to connect with their local communities. “The thing we love most about it is it really ties us all together and gives us all more of a community feel,” said Moushabeck. “We try to choose places that will be really fun for kids to go, and places that will have lots of spots they can hide Waldo,” she said. Sweeties and Captain Candy in Northampton are the trickiest places to find Waldo, she said, because there are so many great places to hide him. At the end of the month, the Odyssey hosts a party for all participants and to draw the grand prize winners. The party will be held Friday, July 31 at 3 p.m. It is free to attend. For a complete list of participating Valley businesses and to obtain a Waldo passport, call Hannah Moushabeck at 413 534 7307. “It’s just a really fun scavenger hunt all over the Pioneer Valley,” she said.